Brought in to work on an oddly shaped property in Panama, Raymond Jungles did what came naturally: He sized up the site, negotiated some key details with the homeowners and, using water, plants and stone, brought their secluded tropical retreat vibrantly to life. When I first became involved with this project, the property was little more than a muddy slope – a dramatic piece of Panamanian topography that nobody had ever considered developing before my clients came along and decided to build a large, custom home. There was a reason it was available to them when they arrived: The building site was a logistical nightmare not only because of the topography but also because of the configuration of the lot. But they moved ahead anyway because they saw it as a great place for an informal (but organized) reproduction of a retreat they owned on Isla Contadora in the Pearl Islands off Panama’s Pacific coast. Among their many design desires, they wanted lots of lush, fragrant plantings as well as multiple water elements in various places around the property. 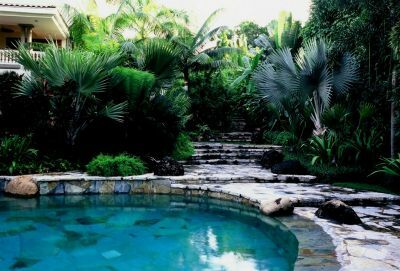 We started with the water, setting up a number of decorative waterfeatures as well as a shallow lounging pool next to the main residence that flows into a freeform swimming pool. In many ways, the all-encompassing presence of water came to define the project. This drawing of the site shows the lot’s unusual configuration as well as the large number of areas where we included water in the design and the spaces we dedicated to big trees. In fact, water won over structure in two key areas: First, where the architect had designed a two-story porte cochere at the entrance to the home, I suggested instead a floating garden pavilion area that would drop off away from the house. This allowed us to pick up substantial planting space and create a water-bound garden entry covered by an overhead structure that rises in the three-foot increments to the front door. We augmented this redesign with a reflecting pool and fountain aligned with the entry platform’s steps, articulating the rising pattern using local stone. Second, I convinced the owners not to build a pavilion/gym where it had originally been situated by the architect: This was a prime portion of the lot – it’s sunniest spot, in fact – and I persuaded them to move the structure to a peripheral spot along the property line where it would offer privacy from the adjacent lot and become less obtrusive when tucked behind a large, existing Mango tree. This left the perfect plot of sun-soaked turf for the main swimming pool. Nearby in the garden for the guest suite, we enlarged the space and set up a waterfall flowing from an eight-foot-diameter bowl. The bowl (which is positioned on the visual axis defined by the Florida room above) and the nearby wall are both covered with a porous river rock whose surface encourages vigorous plant growth. The extensive use of water is a hallmark of the project, including not only the unusually large lounging/swimming pool combination and an entry fountain (not shown), but also a large fish pond/waterfall structure and a large spa. The water can be enjoyed from above, but it’s truly marvelous for occupants of the guest suite below who can enjoy it in a privacy interrupted only by the prying eyes of the fish and turtles who populate the water and the surrounding glade. Getting the clients to accept these significant changes was made easier by the fact that they shared my sense that the interior spaces should flow into the exterior spaces and vice versa – a concept about which I am particularly passionate (and, apparently, quite persuasive). 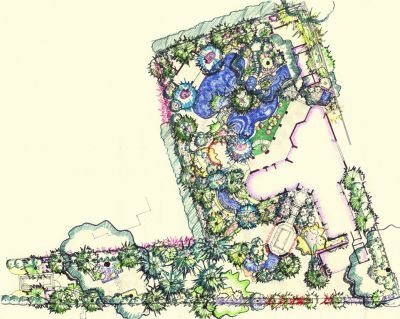 As I see it, designing gardens is a process that’s always best done on a human scale. That’s why most of my ideas flow when I’m there, in a space, visualizing its potential and seeing how I can use what I know about design to unlock the beauty waiting there to be found. At the same time, I’m also burdened by an obsession with detail, which is why it’s so difficult for me to convey the full extent of a design on paper: To infuse a place with poetry, the details must unfold in the moment, in the present, in the only place where that unfolding can rightfully occur. I have these perspectives because my primary inspiration is and has always been Mother Nature. Early visits to Yosemite, Sequoia National Forest and Baja California were followed by a more settled Midwestern upbringing on the margins of urban sprawl. I sought out what was beyond those fringes, taking to mountains, meadows, canyons, lakes, rivers and streams as sanctuaries in which I renewed my spirits. This explains why I take such great satisfaction when a garden grows into a soft, natural-seeming, wild-yet-organized state: These are the times when I feel most connected to all the experiences that have brought me to this place and take my personal compensation for all of the visits involved in keeping a garden interesting and growing in the right direction. Raymond Jungles is founder and principal of Raymond Jungles, Inc., a landscape architecture firm based in Miami, Fla. His prime inspiration and the key to his passion for landscape architecture stems from his longtime relationship with Brazilian artist and environmental designer Roberto Burle Marx, and his current practice is firmly rooted in Florida and the Caribbean basin with a focus on residential, resort and community design. This November, he will be the keynote speaker for 25th annual conference of the Association of Professional Landscape Designers, to be held in Orlando in conjunction with the International Pool|Spa|Patio Expo. For details, click here.